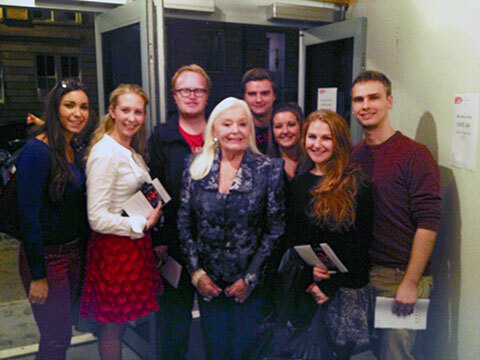 Last week I was privileged to be in the company of Dame Gwyneth Jones. On Wednesday 2nd October, I went to see her being interviewed by Humphrey Burton at the Glasgow Film Theatre with a group of friends from the RCS. Mr Burton’s first job was in the Opera world and he got to look after Maria Callas, an idol of mine, in 1958. Dame Gwyneth Jones is a fascinating lady that draws your attention from the start. She was born on the 7th November 1936 and when she was just 3 years old her mother died at the young age of 28, she got involved in local welsh singing festivals called eisteddfod’s. Whilst watching a performance of a children’s choir singing “They’re Changing the Guards at Buckingham Palace” she decided from then on she wanted to dress up an sing for the rest of her life. 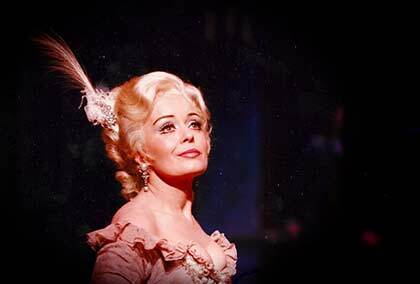 Dame Gwyneth Jones’ first singing lessons were with ‘the girl down the road’. But when her teacher decided to stop teaching she told her “don’t bother learning how to sing as you are not good enough”. :O!!!! She smuggled herself into a children’s choir with her friend so she could get singing lessons by observing the classes. She was found out eventually though as one night she fainted. The choir mistress taught her from then on. 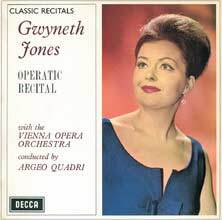 Dame Gwyneth Jones obtained a place at the Royal College of Music age 18, sadly her father died an hour before she received her letter of placement. She auditioned for a scholarship at an Opera Studio in Zürich. At the school in Zürich Czech soprano Maria Carpi taught Dame Gwyneth Jones her technique for the top of the voice which she vouches for even now. “Technique, technique, technique – that’s what will make your career”, if you have your technique “you can fly!” she explained to her attentive audience. One thing that really came across to me is her work ethic. At one time she was learning six Operas in a season. She has sung all of the Strauss, Verdi, Wagner and Puccini roles I admire her so much. We were shown a clip of her performance in Turandot, the clip begins with a climatic and intense long walk in silence, Mr Burton exclaimed in a panic “excuse me” indicating there may be a problem to the technical staff. Dame Gwyneth Jones silenced him with “Shut up, it’s my long silent entrance!” She has a very strong character and she and Mr Burton have been friends a long time. Dame Jones was picked up early in her career by Decca records. We were also introduced to her husband conductor and pianist Adrian Müller who was to accompany her during the master classes to be held at the Royal Conservatoire of Scotland. I am often asked if I sing modern popular music and although I enjoy listening to and singing along to modern pop music and crossover music, my preference is for classical repertoire as it is so vast, fabulous and difficult to do well. I love the personal challenge as I’ve never been one to take a shorter route to what I hope to achieve and I want to find my own voice, unique and not like anyone else. Dame Gwyneth Jones then went on to hold masterclasses with the Masters students at the Royal Conservatoire of Scotland later on the Thursday and Friday; I sat in on all of them, what a remarkable lady. I had to leave one lesson early to catch my train back to Cheshire on Friday afternoon and I could barely pull myself away. I had been paying attention though and rather than walk out of the auditorium whilst she was speaking I decided to leave during a short recess, approached her husband and told him what a marvellous time I’d had and excused myself. 20 responses to Viva la Diva ! Charlotte, still a wonderful story. When you read it seems to be near you. For your chill, if you do not take medicine, try rosemary infusion with honey and a spoonful of whiskey. Merci Pascal, Dame Jones is a fabulous 76 year old, her birthday is next month just a few days before mine ;). She had so much good advice to offer. The chill remedies sound interesting although I don’t like whiskey, my flat mate is a Scot so I guess he’ll have some. It’s a blocked nose and sinus more than a sore throat luckily. For violet in the herbalist to parmacie, waiting for spring to pick …. Rosemary “Rosmarinus” herbalist, pharmacy, dietetics store next to the tea ……. I have full garden ……. I can send you…..and alcool is not necessary. .
You can also look in the kitchen herbs, Thyme and Sage are very good for treating colds. When your birthday falls Charlotte? I like “Opera singers are really the Olympic athletes of singing.” analogy. That gives a different image right away. Yes, I loved that quote. I love how you embrace life. Looking forward to the pictures. I hope you feel better soon. Hi Colleen, I hate not being able to stop a cold getting hold, one minute I was fine last Wednesday going to yoga and feeling fit, that night a blocked nose – yikes – just before a two day weekend of concerts. Thank goodness for paracetamol and vics vapour rub ;). I stayed positive and managed to drink plenty and keep it off my throat. Take care of yourself snd hope you feel better soon. Pascal might have sonething there for a remedy for your cold. My grandfather believed in whiskey, honey and lemon and he would burn off the alcohol with a match. It seemed to work and made you feel warm all over. Lol! Hi Janice, my Grandad takes a sip of whiskey every night before bed he swears by it :/ yuk. I like your idea of burning it off on a spoon :). Dame Jones is so attractive and full of energy and vibrancy and to still be doing what she loves must be amazing. Love your story about Dame Jones and it sounds like a fabulous lady who’s had a fabulous life, but not without hard work, struggles, and lots to overcome with losing both parents. I admire your desire to work on your singing and sing in a class with the best. How wonderful that you got the opportunity to observe her first hand. I’m thinking you have a wonderful future ahead of yourself also as it sounds like your work ethic isn’t lacking either. Thanks so much for sharing your story. Feel better soon. Enjoyed my visit. Dame Jones revealed stories about performing in the evening then early the next morning jumping on to planes or in a car to make the next performance on time so it is important to build up good stamina, luckily I find it very easy to cat nap for an hour during the day and sleep in a car or train 😉 which is a bit harder if you’re travelling on a train alone. Some day, an aspiring singer will be writing about meeting you and being inspired by you. Plaese correct this Dame Jones nonsense – it’s Dame Gwyneth. Same as for a knight. Thank you for alerting me to this, happy to correct my post I wasn’t aware the convention.